Although every galaxy is unique, astronomers use classification schemes to group similar galaxies with each other in order to better understand how galaxies form and evolve. The two broad characteristics for classifying a galaxy are its color and its morphology (shape/structure). To measure color, astronomers look at whether a galaxy emits more red light (longer wavelengths) or blue light (shorter wavelengths). Galaxies with more blue light are younger and have recent star formation, as new, hot, young stars emit more blue light (hotter things are bluer). In older galaxies, these stars are long gone, leaving cooler, longer lasting stars that emit more red light than blue. To determine a galaxy’s morphology, astronomers look at various physical characteristics, such as whether or not the galaxy has a defined disk, or spiral arms (like our Milky Way), or is fairly featureless (like an elliptical galaxy). (As an aside, if you want to try your hand classifying real galaxies for actual scientific research, there is a fantastic open-to-the-public project called the Galaxy Zoo that allows you to do just that). Astronomers agree that galaxies evolve from one type to another, but we are not completely sure has to how this happens. Dramatic events such as galaxy mergers play a significant role in galaxy evolution, as well as processes that remove gas (which is the fuel for star formation) from galaxies, such as ram-pressure stripping (RPS). In RPS, a galaxy moving quickly through a region of gas (like that found in galaxy clusters) is stripped of much of its gas, effectively cutting off star formation. There are several well-known examples of in-progress ram-pressure stripping events in nearby galaxy clusters (for example). The strongest RPS events are those that can completely strip a galaxy of its gas in under 100 Myr, and are seen to occur in galaxy cluster simulations. However, we don’t yet have a large sample of observations of strong RPS galaxies because 1) they are more rare, requiring very fast moving galaxies in very massive galaxy clusters, and 2) looking for these strong events has only been possible recently. The authors announce the discovery of several new, dramatic examples of galaxies undergoing ram-pressure stripping in galaxy clusters. Due to their appearance (see Fig. 1 and Fig. 2), the authors refer to these galaxies as “jellyfish” galaxies. The authors look through a sample of 37 galaxy clusters from the Massive Cluster Survey (MACS) that were observed with the Advanced Camera for Surveys aboard the Hubble Space Telescope. From this sample, the authors go through and pick out (by eye) galaxies with obvious, readily-visible ongoing ram-pressure stripping. The authors use this sample of galaxies to establish well-defined criteria that they will later use to identify less obvious ram-pressure stripping galaxies in a larger sample of galaxy clusters. Since RPS removes gas from galaxies, the authors look for galaxies that have gas warped or shifted from what would be expected in a non-RPS galaxy. In addition, the pressure forces of RPS can cause a brief increase in star formation, forcing the collapse of already-dense molecular cloud regions. The authors look for the tell-tale sign of increased brightness due to star formation, and a color gradient from redder to bluer stars, possibly indicating a separate, younger population of stars was formed more recently than most of the stars in the galaxy. Finally, the authors look for long tails of gas and stars that are unambiguous signs of a dramatic, RPS event, and are responsible for the jellyfish-like appearance. Fig. 2 shows the 6 most dramatic examples of ram-pressure stripping identified by the authors. For each galaxy, the red arrow indicates the direction of motion of the galaxy within the cluster (in projection along the plane of the sky). 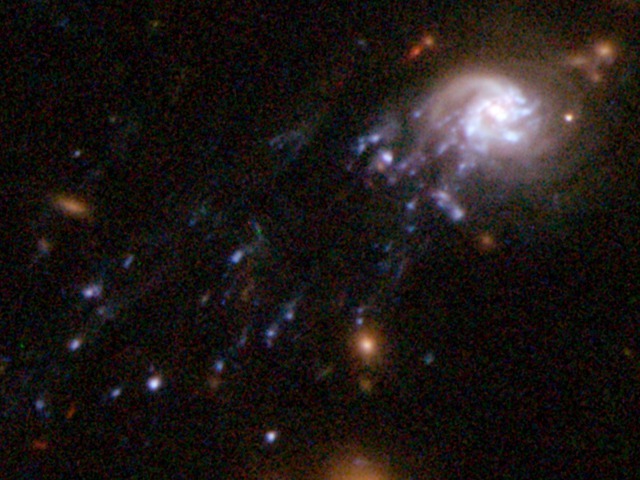 The authors ensured that the direction of motion of the galaxy and the direction of the debris trail behind the galaxy was consistent, as is expected for RPS. In each image, the yellow arrow gives the direction and distance (in projection) from the galaxy to the center of the galaxy cluster. Although each galaxy in Fig. 2 has similar trailing debris tails, making each galaxy look like a jellyfish, with noticeable blue knots that indicate star formation, each of the galaxies are different. The differences arise from the different orientations of the moving galaxy within the galaxy cluster (whether or not the RPS is acting edge-on or face-on to the galaxy), different velocities of the galaxy and densities of the gas in the galaxy cluster, and finally by virtue of the fact that the galaxies have undergone RPS for varying lengths of time . The authors emphasize, however, that these galaxies are all some of the brightest in their respective galaxy clusters, due in part to the enhanced star formation that occurs during RPS. Each galaxy in this sample is unusually close to the center of the galaxy cluster (<500 kpc). This is odd because we would expect RPS to remove a significant fraction of the galaxy’s gas by the time it reached roughly 1000 kpc from cluster center. Although there is yet no good explanation for this, the authors discuss that possibly, by looking for the most extreme examples of RPS, they have self-selected to find examples of RPS that are both strong and unusually long lasting. This sample of galaxies marks a first release in a larger sample of new ram-pressure stripped galaxies in a galaxy cluster survey examining clusters over the redshift range 0.3 < z < 0.5. A larger catalog of RPS galaxies will help us better understand its effect on stripped galaxies, and its role in galaxy evolution. 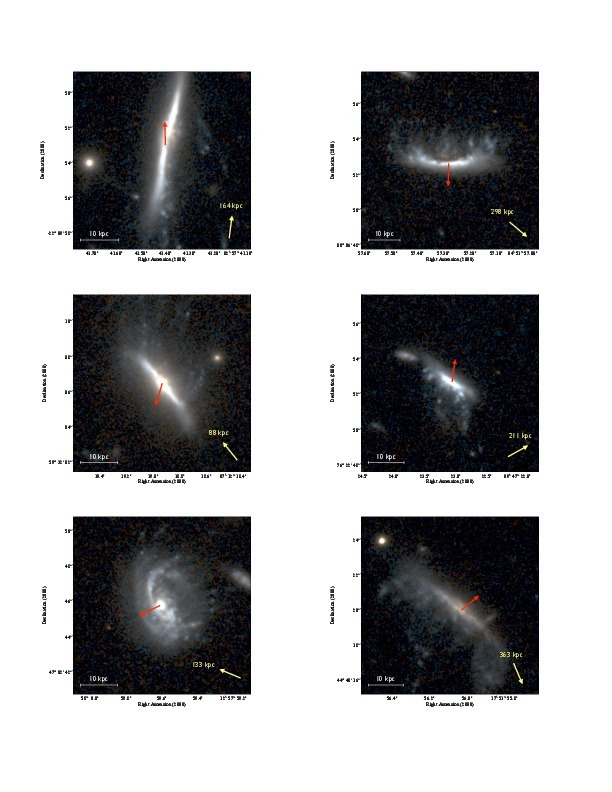 Finally, the authors note that conducting detailed, follow up observations of these galaxies, looking at, for example, the star formation history, is essential for understanding the history and evolution of these galaxies.